26-year-old Chris Medina auditioned for American Idol in Milwaukee, which aired on Wednesday January, 26, 2011. Before Chris sang, he moved the judges and America to tears with his story. 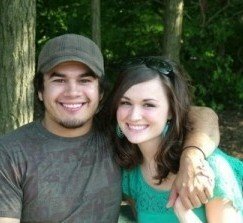 (Photo of Chris Medina and Juliana Ramos before the accident – from their Facebook page). Two years ago Chris proposed to Juliana Ramos, his girlfriend of eight years. Just two months before the wedding, Juliana was in a serious car accident that left her in a coma. The doctors told the family she had suffered a traumatic brain injury (TBI), several fractures to her face and they did not think she would wake. “Her chances of surviving through the night were in doubt and it was much too soon to speculate about her prospects for a full recovery” posted the Laurus Foundation, an organization assisting in raising funds for Juliana’s medical bills. Chris then continued with his audition with a very emotional and heartfelt song, “Breakeven” that seemed to express Chris’ journey during this very difficult time with the love of his life. The judges were so taken by his story, that they asked him to go get Juliana, then quickly ran up to greet her when she entered the room. Steven Tyler bent over, gave her a kiss and affectionately told her Chris sings so good “because he sings to you.” After the judges introduced themselves, they exclaimed that Chris was “going to Hollywood!” and the entire family rejoiced! Our hats are off to this young man who refuses to walk away from his fiance who is now living with TBI. Sadly, many spouses often leave the marriage when debilitating illness or injury enters their lives. Since they hadn’t married yet, Chris could have easily chosen to step out. Chris and Juliana have a very long road ahead, as they face continued rehabilitation, extensive therapies and surgeries. It won’t be easy, but they have the support of friends and family – something everyone living with a disabling condition needs. 2/17/11 UPDATE: Chris moved on to the final round in Hollywood which will determine if he will be in the top 24. 2/23/11 UPDATE: Chris was not chosen to be in the top 24. What Has Become of Me? 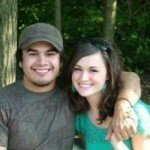 Video and song by Chris Medina the day they were supposed to be married. Many spouses leave their husband or wife when debilitating illness or injury occurs. This story is so inspirational to me and so many others living with various disabilities.Thank you, Chris, for being a “real” idol to model the true meaning of love and commitment. Hugs and love to you, Juliana! Hi Juliana, God bless you my friend. I am a traumatic brain injury survivor. To read about my story please visit my About page here http://secondchancetolive.wordpress.com/about-second-chance-to-live/. I am available to be of service to you and Chris. Please contact me at http://secondchancetolive.wordpress.com/leaving-comments/. As you have questions, please ask. All questions are good questions. I look forward to hearing from you and Chris. Have a pleasant and rewarding day!